If your body feel weak, or you are a bit depresses and want to find a place where you can relax, Gadek Hot Spring maybe the answer for your problem. 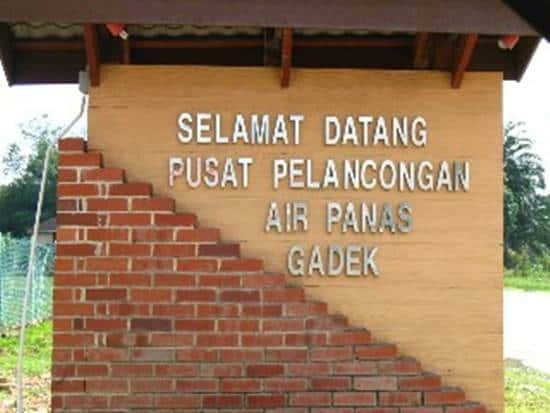 The Gadek Hot Spring is located at Gadek, Alor Gajah. 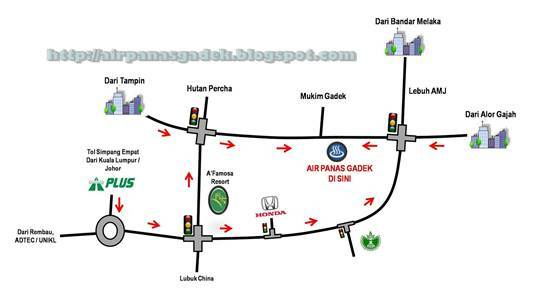 It is only 5km from Alor Gajah town and bout 25km from Melaka town. It also near to one of Alor Gajah’s tourist attraction, A’Famosa resort. Gadek Hot Spring is open 24 hours daily which mean you can go to the hot spring any time. It can accommodate about 500 guests at a time and it is frequently visited at night. This hotspring has therapeutic values and can heal multiple illnesses from simple stress to skin problems. Source of hot water produced from natural sulfur and it is good for blood circulation. The hot spring has been verified that the content of minerals inside the hot spring including magnesium, silica, phosphorus, sulfate, boron, calcium, chlorine and fluoride. These minerals are good for our well being. The Gadek’s hot spring was discovered by English soldiers during the British rule in Malaysia. It was not known by locals, but rumors has it that there’s a place where the British soldiers used to treat disease. The villagers was also curios especially when many British officers and soldiers lived near the pond. It was a well kept secret as only after the British left, the villagers found out about it. The Gadek Hot Spring has 2 large pools and several smaller 3 feet tall above-ground pools. Other than hot spring pools there is also a restaurant available for visitors. During the school holidays it is always packed with people from all over, both locals and foreign. Entrance fee for adult is RM5.00 while children between 6 and 12 is RM3.00. Now, get yourself to Gadek Hot Spring, have a nice bath and your body will feel better.